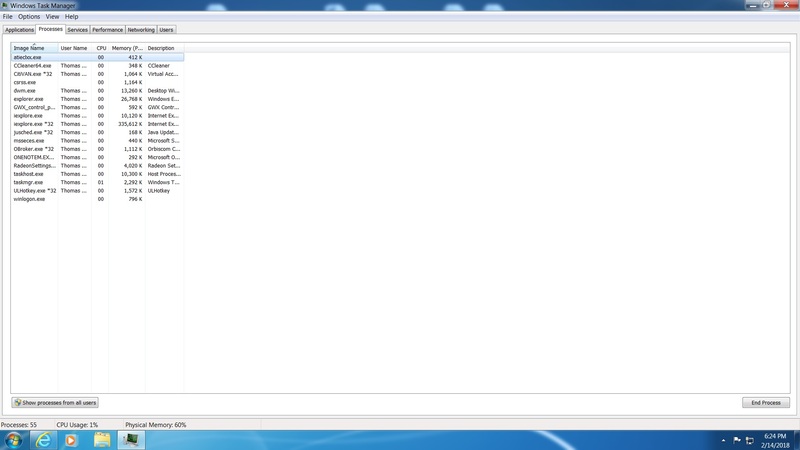 I have a Windows 7 SP1 with Internet Explorer 11 desktop. 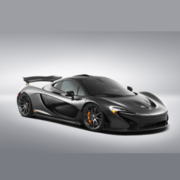 I use Outlook.com as my web based email service. "Live.com is not responding due to long running script" with an option to STOP SCRIPT. If I do nothing the message goes away and everything is working. I don't seem to have any issues with any other service except maybe TWC (Weather.com) which always has run slow because of all the video adds trying to load. The Outlook email thing just started. I wrote to Outlook tech help and they said it seemed like my browser (IE) was unstable and they wanted me to reset it. I wrote back and told them I did not think so as I wasn't have trouble with anything else It seems their browser (Microsoft) does not run well with their email service. I see Microsoft is offering a Beta version of the new email which I declined. I have a suspicion it is the same old story with Microsoft trying to force you onto the new service. Has anyone had this experience or can you offer any suggestions. 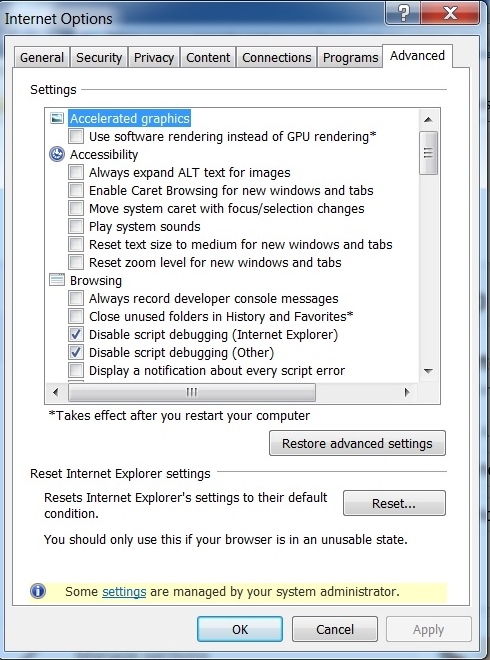 I notice in IE options there is an option about script debugging that is checked. I don't know what this is. 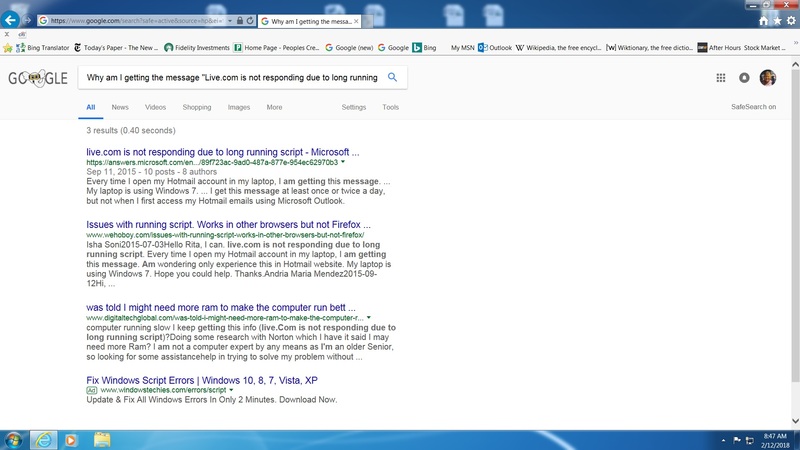 I also notice that in doing a Google search a lot of people have had the same problem with the Microsoft email service. See the first Google search hit. off the bat I would be trying another browser, say Firefox or Chrome. I agree but it seems to be only based with IE and Outlook.com email or to put it another way Microsoft browser with Microsoft email. It is not happening with anything else. What do you think of that? IE script errors is something that's been around forever, and it was one of the reasons (along with security) I abandoned IE back in the Win98 era and never looked back. They've probably changed something on Outlook which isn't all too surprising because when they change something it will often cause problems in other web browsers. Reporting it to them like you've did is about all you can do if it's a problem with their website, and if that gets nowhere perhaps try as mta suggested give a different web browser a whirl, also perhaps get an email account elsewhere if it's too frustrating to deal with. Also, they are changing Outlook.com. They have a BETA version that they want you to try and they give you the option to toggle between the Beta and the old version with a toggle switch at the top RH corner of the page. The problems seem to have started when they offered this. So the Microsoft email does not work in the Microsoft browser. The email works in other browsers. I don't have trouble with anything else. 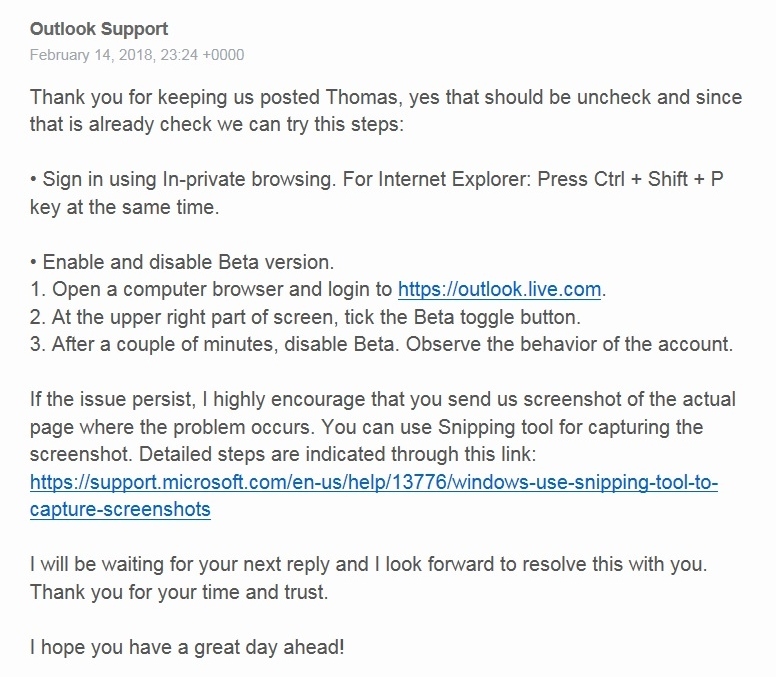 I tried this from Outlook support and the second option of toggling between the Beta and the older version seemed to have helped. At least someone is there willing to help! Which in of itself seems extraordinary in this day and age. I agree. This fellow, Raymond, at Outlook.com support took a lot of time going back and forth with me trying to help. I believe the problem lies with the Microsoft email and Microsoft browser combination. I don't believe the IE browser on my computer needs to be reset as it works fine with everything else. Almost! It works fine with GMail. What is that all about??? I thought that, so I looked in the Task Manager to see what was running and the only Java I see is Java scheduling (jusched.exe at 1160 k Java Update). It doesn't look like that would be the problem. Does it?